A longboard is generally speaking a longer, wider skateboard with larger, softer wheels. They are designed to give you a smooth carve and stable ride that emulates surfing the streets. They also handle rougher streets and foot paths with soft wheels to absorb the inconsistent surfaces, and maintain your speed and control. 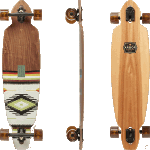 Longboards commonly use reverse kingpin trucks, known as Longboard trucks. These wider, taller trucks enable your board to turn in sharp, tight arcs and help you handle speed. At Basement Skate, we have the best selection of longboards for cruising, dancing, sliding and racing this side of the equator. Our selection of pre-made / complete longboards has every style of riding covered, from dancing to downhill, cruising to commuting. Complete longboards are the most economical way to get your first board. Our completes come set up with quality components, and are ready for you to roll out the door. We stock complete longboards from the leading manufacturers from around the world. We have American brands Arbor, Bustin, Dusters, Gold Coast, Prism and Sector 9. From the polite Canadians, we bring you Landyachtz, and from Australia we stock Globe. At Basement Skate, we offer you 10% off components when you build your own setup. That is bearings, trucks, wheels, bolts and griptape! We stock some of the sickest longboard decks from industry leading brands like Arbor, Bustin, Comet, Earthwing, Fang, Landyachtz, Loaded, Omen, Powell Peralta, Prism and Rayne. Whether you’re looking to bomb some serious inclines, pull some super steezy slides or just cruise and enjoy the fresh air and sunshine, we have a longboard for you! Any longboard setup is a great vehicle to transport you anywhere you wish to go. If you’re new to skateboards and longboards or are looking to commute over longer distances, we recommend choosing a ‘drop-through’ style board, with a lower centre of gravity. Having a lower ride will make it easier for you to push the distance, and will be very stable and cruisy. Drop-through boards give new riders more room for error, which is a more fun way to start out. If you’re a proficient skater and are looking to commute on a longboard, you would be wise to consider a top mount longboard and even something with one or two kicks. A double kick board with semi soft – soft wheels is a super spontaneous ride. If you want to crush the city as you ollie, pump and manual through the crowds, this is your style of commuter. Cruising and carving is essentially surfing the streets. If you’re looking for a board that you can carve up hills and pathways, and pump some speed along the flats, you want to go for a top mount longboard or a drop-through with a bit of flex. Top mounts are a great option for carving, as they give your board heaps of lean and turn so you can really throw your weight around. The top mount style also allows a much more responsive feel, and gives you a lot more leverage to pump the most out of your turns. Drop-through decks with some flex give you bounce and useable energy when your pumping and carving. This can help you get in rhythm and flow with your turns. Loaded are famous for their range of high quality and technically advanced drop-through carving boards like the Icarus, Dervish and Tan Tien. If you want to dance and cross step your way down town, go for a Dancer. These are longer decks, usually between 40”- 48”, so you have all the room you need to cut a rug and get super techy with your tricks. Dancers have a bit of flex to give you a bounce out of your carves, and smoother, softer landings that are easier on your back and knees. Most dancer boards are symmetrical and have small kicks to help you nail shuvits and kick up your board like a pro. We stock an awesome complete dancer set up from Bustin longboards from New York City. We also have a range of dancing deck ready for a good home from Landyachtz, Loaded, Omen and Rayne. Imagine your snowboarding…carving, slashing and shredding 180’s and 360’s down the mountain. Now, swap the snow for asphalt and you’ve got longboard freeriding and sliding. It can be fast or slow and it’s totally up to you how you choose to get down the hill. Freeride and sliding set ups usually have round lipped soft / semi-soft durometer wheels. The round lipped wheels allow your board to break traction easier and smoother, as you initiate your slide. The rounded lips also help your board slide further, and give you a smooth transition back to traction. For slower speed sliding a thinner contact patch wheel with a slightly harder duro (82A-90A) is easier to push out and great fun banging around town on. When you start sliding at higher speeds, a wider wheel with a softer duro (75A-83A) will give your more control and balance as you slide. When you start maching into 100-foot power slides, you’re going to want all the control you can get. You’ll be looking for a real soft wheel (75A-80A) to control you speed and a wide contact patch, and even a hard-lipped wheel, to give you enough traction to really sit into your slide, to max out your style points. A freeride and sliding deck will be quite stiff, have a comfortable length and wheel base for your stature and stance and should have some concave in the pan shape. They can be top mount decks or drop-through’s, which is all up to personal preference. A top mount board will have sharper, more responsive carves, where as a drop-through board will be more stable at speed, however some-what restrictive. If the board is too flexy, you’re going to have some bounciness and unpredictability during your slides. At slower speed, it may not be an issue, but as you go faster, torsional flex will become an issue when sliding. You should feel comfortable and at one with your board as you’re carving into your slides. If you’re cramped up too much, or are a tiny human on a huge deck, you’re going to struggle to control your board safely as you slide. A board that is too short will whip you around if you aren’t used to the feeling, and a super long board will be very drifty, and you may struggle to come out of the slide. Trucks for your free-ride set up are usually a higher degree long board truck (48 degrees and up). The higher degree truck will allow you a more responsive and lively feeling under foot, which will give you a more accurate carve and slide. Having a lower degree truck is still ok for free riding, however, you’ll notice the difference a lot more at low speeds, as the lower degree will be more restrictive and have a dull slow turning feel. We have an array of free ride trucks from Arsenal Trucks, Bear, Caliber, Fang, Gullwing, Paris, Rogue, Sabre and Aera. Downhill skateboards / speed-boards are about stability and control. The decks tend to be the stiffest boards, and have solid concave to lock your feet in place. At higher speeds, it’s important to have trucks and bushings that will handle the speeds and direction changes safely. Wheels and bearings are also important considerations, as this can increase your grip and roll speed. 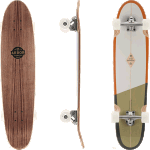 Having a stiffer longboard deck will give you a more stable ride at speeds. If there is some flex in the board it can allow too much movement under your feet, and can turn to speed wobbles very quickly. Concave is an important feature in downhill (and free ride) decks, as the varying concave shapes offer solid locked in foot placement. At speeds, if your feet aren’t comfortably stuck to the board, you won’t have total control of your direction and speed. Some of the common downhill deck concaves shapes are Radial, Flat cave, Elliptical and W concave. Each shape has a different feeling under foot, and comes down to personal preference. Downhill boards can have wheel wells to give your wheels more space to turn harder, which will also give your feet a nice pocket to push into. Speed-boards can be drop-through which will give you a more stable ride and super high speed; or they can be top mounted. Top mount downhill boards will feel a little bit squallier at high speed, but will be more responsive and will rail tight corners with more grip. Advanced riders tend to go for top mount speed-boards for maximum control. We have a huge range of downhill decks that have been tried and tested by some of the world’s best riders from Fang, Jet, Landyachtz, Loaded, Powell Peralta, Prism and Rayne. Choosing the right set of trucks for your downhill board can make all the difference to how fast and controlled you are on your decent. When you’re going faster, you will feel more stable on a lower degree truck. That is below 48 degrees. A lower degree truck gives your turn a softer, more predicable feel, with more resistance. We have a huge range of cast longboard trucks in varying degrees / angles from Arsenal, Bear, Caliber, Fang, Gullwing, Luxe, Paris and Rogue. The construction of your truck should be a strong consideration when going fast, as forged and CNC parts offer higher levels of strength and precision. Forged Components are the strongest and toughest in the long run. If you want a downhill truck that will go the distance, perform with the best and not break the bank, Sabre trucks come with forged hangers and Paris Savants and Bear Kodiaks are both offer fully forged hangers and baseplates. CNC billet trucks are as precise as a truck can be make. Precision trucks get their name from their superior construction methods producing precise dimensions. By taking an aluminium block and laser cutting your hangers and baseplates, there is ultimate precision is every aspect of the CNC billet truck. When you’re going as fast you can, this precision can give you the stability you need to rail that corner, or bomb that hill. We have CNC trucks from some of the best manufacturers Aera and Liquid. Downhill bushings will help you adjust how freely your trucks will move, which translates to control and stability. Considerations when choosing bushing are your weight, relative speeds being achieved and your personal preference as to how loose or tight you like your board to feel. We stock a range of downhill bushings from Venom, Loaded, RAD, Riptide and Sabre. Having griptape that you can trust is super important for downhill and free-riding. If your feet aren’t stuck to the board when sliding and railing corners you going to slip and fall, like thongs on wet marble. ‘Big Rock’ griptape is the best way to ensure maximum grip to your deck. It’s very coarse and thick, and gives you the security you need when getting gnarly. We have big rock grip tape in red, clear, blue, purple, black and various funky designs, from Blood Orange, Globe, Landyachtz, Venom and Vicious. When bombing down hills, selecting the appropriate wheels will give you the competitive edge in relation to roll speed, grip and acceleration. Racing / downhill wheels have square lips to give you the most grip around corners, with a wider contact patch offering you more grip to the road. Having a very wide wheel will be slightly slower in a straight line, due to increased resistance. On a rougher surface, a softer wheel (75A – 80A) will be faster, whereas a harder wheel (82A-87A) will roll faster over a very smooth surface. A larger diameter wheel will have a higher terminal velocity. However, a smaller diameter wheel will accelerate faster. Taking these factors into consideration will give you the fastest and safest hill bombing experience. Basement Skate stock a very large range of downhill and racing wheels from some of the world’s most renounced manufactures Abec 11, Cult Wheels, DUI, Face Skate, Globe, Hawgs, Orangatang, RAD and Venom.